This Honda Civic Sdn boasts a Gas I4 1.8L/110 engine powering this Automatic transmission. Vehicle Stability Assist (VSA) w/traction control, USB audio interface, Tilt & telescopic steering column. SmartVent front side-impact air bags w/passenger-side occupant detection system, Smart Maintenance Minder system, Security system, Seat belt warning chime, Remote entry -inc: power trunk release, Rear window defroster w/timer, Rear seat heater ducts, Rear independent multi-link suspension, Pwr-assisted ventilated front disc/rear drum brakes, Pwr windows. 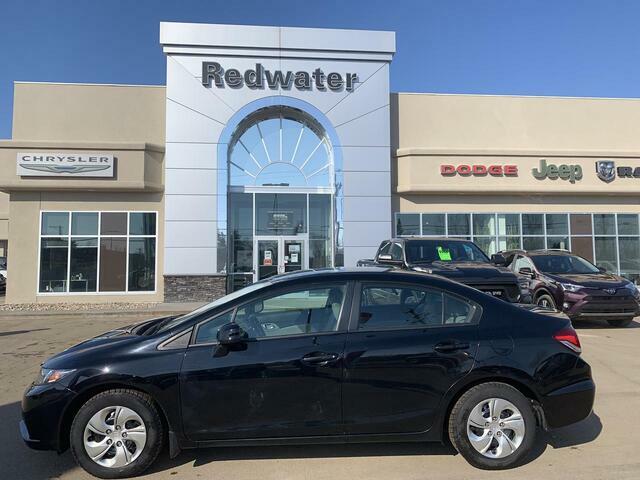 For a must-own Honda Civic Sdn come see us at Redwater Dodge, 4716 48th Ave PO Box 407, Redwater, AB T0A 2W0. Just minutes away!